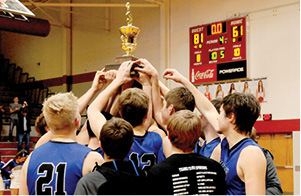 The Clinton County Bulldogs are headed back to Richmond, Kentucky this week to compete in the All “A” Classic State Tournament at McBrayer Arena. Clinton County defeated Cumberland County in the 4th Region Championship game Friday night, 81-61. This is the first time in school history the Bulldogs have made the trip to the All “A” Classic state tournament in back-to-back years. Clinton County will face 15th Region Champions Shelby Valley on Thursday, January 24 at 5:30 p.m. local time. Shelby Valley is sporting an 18-2 record and defeated Piarist School, 78-30, Prestonburg, 62-38, Paintsville, 61-55 and Pikeville, 50-48. On the road to Clinton County’s 4th Region All “A” Classic title, the Dawgs defeated Metcalfe County 68-44, Monroe County 69-59 and Cumberland County, 81-61. In the top photo, players, coaches, cheerleaders and family came together to celebrate with a team photo. In the photo right, the Bulldogs hoisted the championship trophy after receiving it during the awards ceremony. In the background is the scoreboard with the 81-61 victory showing. Advance tickets for Thurdays game are available at the C.C.H.S. front office for $8 each, until 12:00 noon Thursday, a savings of $2 per ticket on the general admission price.